After about 25 hours on the plane, we’ve finally touched down in Jakarta. The time here is about 12 hours ahead from East Coast US, so it’s about 3:30am as I write this. Just like how the winter chill hit my face and shocked me when I first arrived in US, the very thick humidity also caught me off by surprise tonight when I came out of the airport. I knew it was going to be humid but I didn’t remember how bad it can get here during the rain season. The first thing I want to mention is how much impressed I am with Emirates Airlines, especially the Airbus 380 service from JFK to DBX (Dubai). We sat in economy but the seating space we have felt like first class in any US domestic flights. We get hot wet towels twice during the flight (once at the beginning, and another before the main meal course). Drinks are free, even alcohol, except for champagne. Tons of movies to choose from, and the food were amazing. They come with appetizers, main course, side bread and dessert. We had 2 meal course, both with unique options. 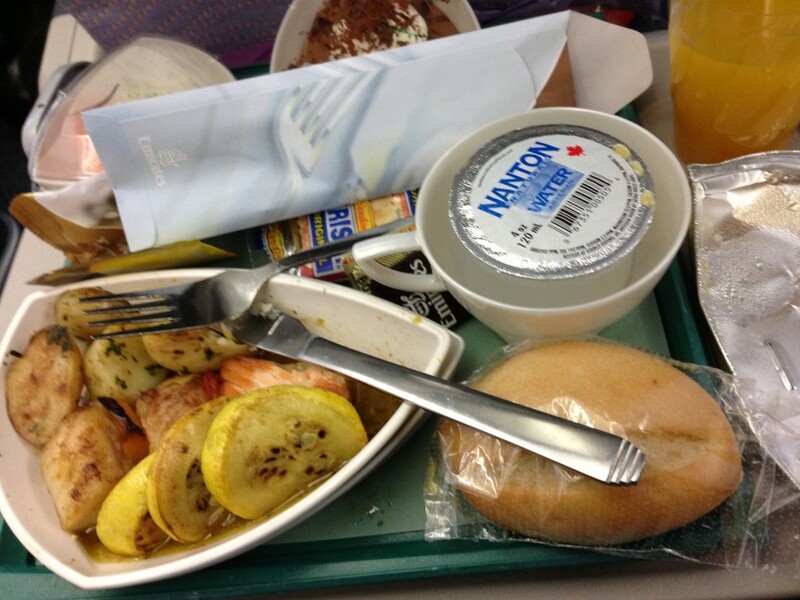 We also had sandwiches, fruits or snacks that are always available throughout the flight on request. I’d go as far as saying the meal were better than I’ve had in some restaurants. The second leg of the trip was delayed by about couple hours. We had a straggler who got lost in Dubai Airport and we had to wait while the airline look for their bag. Long story short, we didn’t arrive to Jakarta until right before midnight. It’s been a long couple days, and I look forward to seeing Jakarta some more once I get some sleep.